We have been keeping track of our food costs for many years, and have found that without skimping on anything, our daily cost per person as of 30 June 2011 was $4.70. 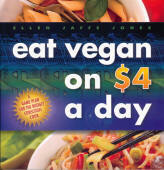 When we saw the title of this book, Eat Vegan on $4 a Day, we became intrigued and wanted to know more. When we saw that it included breakfast, lunch, dinner, and a dissert or snack, we knew that this was a book we had to review. Ellen Jaffe Jones guides us through her food buying choices and why she makes the decisions she does, and how not to fall into the consumer traps set for the unsuspecting shopper. She includes tips on saving money, cooking techniques, and typical daily menus and costs before heading into her very interesting recipes. Through her use of humorous quips in Eat Vegan on $4 a Day ,Ellen adds interest to her recipes, which cover: breakfast, soups, salads, dressings, entrees, spreads, side dishes, desserts, and snacks. Each recipe includes helpful hints, substitutions, also alternatives, such as eliminating or reducing oil, that make preparing her recipes much easier and enjoyable for the average cook. We highly recommend Eat Vegan on $4 a Day for every home and cook. Ellen Jaffe Jones has been an award winning reporter and journalist, and a financial consultant dedicated to social responsible investing. As a result of her personal quest for better health, she now teaches cooking classes affiliated with the Physicians Committee for Responsible Medicine, and is a certified personal trainer and running coach.